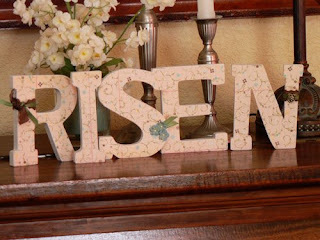 a new addition to easter decorations this year. very simple decoupage project, but it was a lot of fun to put together. the paper is from the making memories noteworthy line. i have loved working with that paper. also found ribbon from that line sold by the yard. did not even know it was even ever available like that. very pretty. now i am not usually a flowery girl, especially in my home projects, but i came across these little adhesive pears, and loved pairing them with making memories paper flowers. just sweet!